A once fishing and agricultural village, the origin Benidorm, as does almost all of Spain, goes back to the Arabs, who not only gave it its name but also left the sinuous narrow streets as a signpost very particular to the Arabs. The old part of the village is found in the center of the bay, having been divided in two parts which can be seen with the so called “ Mediterranean Balcony “ which was built over a castle. Even though it has been overtaken by progress with its unlimited restaurants, discotheques and shops, the Benidorm area surrounding the church still holds its enchantment. But it must be said at this point that Benidorm is not the typical place you would go to visit museums or similar attractions. The main attraction here is fun, sun and finding new thrills. What was once a forgotten fishing village suddenly fell into the hands of a very clever businessman who realized the attractiveness that this place had and the innumerous possibilities it had to offer thanks to its climate and geographical location.It began popularizing its seafront hotels and typical Spanish food which was quite appealing to the retired, both local and foreign. But many families caught onto the great flight, hotel and car hire package deals and uncovered the magnificent beaches their kids could enjoy too. You needn’t go on an expensive cruise to be able to get a close up view of the most popular marine animals like dolphins or seals or have to go deep into the tropical forest to sea funny talkative parrots but can actively participate in the shows and go aboard the glass bottom boat for a memorable ride. 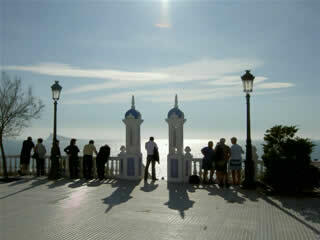 The main gate is near the Mediterranean Avenue right in Benidorm. Take the time to explore this attraction and enjoy the surprising entertainment. The mundomar lies right next to the aqualandia park a bit north of Benidorm. See Benidorm map here. Is right inside the city and depending are where you are staying, you have convenient buses, can walk or drive there. The park offers all kinds of water activities for all members of the family. There are shaded areas, cafes or restaurants for eating or snack time and hammocks or chairs for time out. All the pools, be they large or small are well watched by qualified lifeguards and there is a first aid station for any emergency. It is a nice way to keep cool and watch the children have fun while you sit back a sip some Spanish refreshment. This theme park is relatively new, having been inaugurated in 2000 and proposing an ambitious project of making anybody and everybody travel back in time, back to the legendary civilizations that lived in the Mediterranean area. There are also two day and season passes. You can buy these tickets at banks, the department store El Corte Ingles, authorized kiosks and at the gate at the theme park. Just another fun spot to let your imagination go wild. 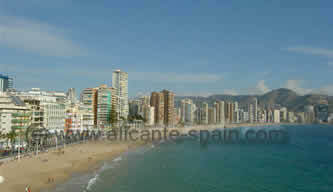 Others – There are various other parks and attractions around Benidorm. One of the latest is Terra Natura a animal park. So you will find plenty of fun places at the area, especially when traveling with kids. 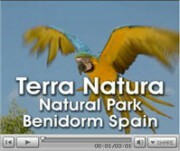 Details and a short video on the Terra Natura park in Benidorm here. Especially if you are visiting these parks during off-season make sure you check there opening hours. Some of parks close during the winter months. Benidorm is probably one of the only place that has the highest concentration of entertainment for all ages and the most extensive selection of pizzerias, hamburger joints, taverns, restaurants of all prices and nationalities in all of Spain. Are you going to risk missing all this?